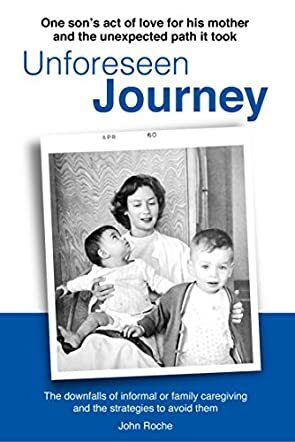 Unforeseen Journey by John Roche is a journey of personal caregiving that should prove helpful to all caregivers who find themselves having to take care of disabled and/or elderly relatives. His book centers on the 10 years that he had to care for his mother, who had suffered from several strokes. Through Roche’s writing, we follow “Ma’s” slow deterioration — in the beginning, she was able to go to restaurants occasionally, eat on her own, and follow her favorite TV shows. Over time, she became less and less functional and would have to be fed, bathed, and taken to the toilet — a slow, painful process that is no doubt familiar to many readers who have found themselves in a similar situation. On top of it all, she developed Alzheimer’s. Over time, Roche began to think of her less as the mother he had always loved and more of a burden, and in retrospect, he blames himself for this state of affairs. Unforeseen Journey is not a handbook for caregivers as such, but he does include, in addition to his own story, information on such life-sapping diseases as stroke and Alzheimer’s, as well as caregiving advice and the location of organizations that help caregivers. It should also be mentioned that during his ordeal, Roche had the assistance of two very good professional aides. As we’ve mentioned, he blames himself for not being sensitive enough to his mother’s needs, but I think he’s being too hard on himself — few people are prepared for this situation and almost no one welcomes it. All in all, if you’re someone who finds himself or herself having to care for someone who is incapacitated, this book will be a valuable tool to help you.